Kalehoyuk is located next to Kaman-Kirsehir highway on 3 km north. Hill is a typical Anatolia hill with 280 m diameter and 16 m height. A construction with four floors was found. Japan Middle East Culture Centre President and Kaman Kalehoyuk Excavation Committee Honor President Prince Takahito Mikasa started to Kaman Kalehoyuk Excavation Works on 31 May 1986. The excavation still continues with the presidency of Dr. Sachiro Omura. 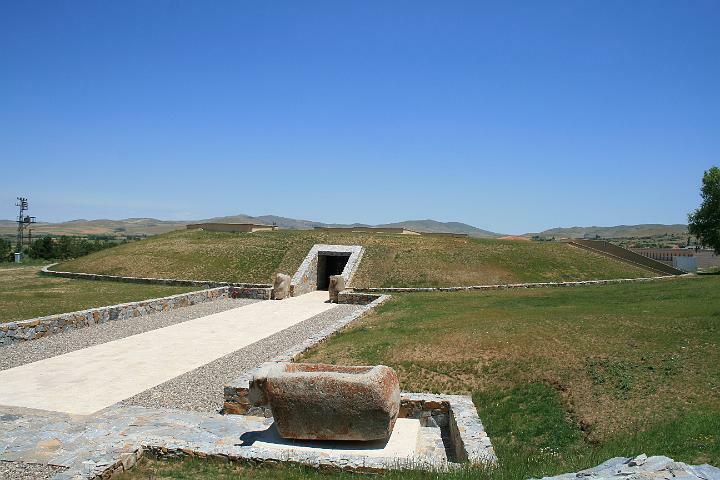 Those excavations made here lighten the history of the earliest residental place of Kirsehir. The earliest residental is dated as early Bronze Age. Fourth Stratum: Early Bronze Age (BC. 23-20). Next to the excavation site, there is Japan Anatolia Archeology Instituon and Kaman Kalehoyuk Archaeology Museum. Moreover, next to the excavation house there is Japanese Garden (Mikasanomiya Memory Garden) which is the biggest botanic garden out of the Japan borders and made by the Japanese who took place in the Kalehoyuk excavation works. The institution consist of three main section; the research department, storage section and staff accommodation area. The research department includes laboratories for researches related to excavations and other types of researches, study rooms, a library, a conference hall and photography room. The purpose of this institution is to run archaeological excavations and surface researches, study the artifacts and data obtained and puplish the findings. Also, to keep local people informed of Anatolian history and raise awareness in claiming their historical legacies are important missions of the institution. Kaman Kalehoyuk Archaeological Museum which is built benefiting from Japanese Goverment's unrequited grants under the ''cultural heritage protection program'' was designed as tumulus by inspiring in its form. Its architecture was designed to provide opportunities for the visitors to come and see excavation methods and at the same time removed excavation works. The museum with 1500 m² closed area consists of 830 m² outdor and 470 m² indoor exhibition halls, the laboratory which allow to review, to photo, to research works of art and the restoration, audiovisual, presentation, facilities, conference room, a library, storage and administrative section. The climatic conditions of the region has been taken in account to determine the appropriate heating, lighting, security systems and the materials to be used and the building has been designed and built in a way as to provide the most economic solutions. The museum that has become a symbol of the friendship and cooperation between the two countries, was opened on July 10, 2010 in the presence of Prince Tomohito Mikasa and Princess Akiko Mikasa of Japan and Mr. Ertugrul Gunay, the minister of culture and tourism. Kaman Kalehoyuk Archaeological Museum is one of a kind with its architectual design. It is the first and only museum to have been built the shape of a tumulus. This garden is next to the Kalehoyuk excavation house in Cagirkan Municipality in Kaman District. It was made by Japanese Middle East Culture Centre in 1993 as a memorial for the start of excavations by Altes Prince Takahito Mikasa and it was also aimed to make a recreation area for the local people. Japanese Garden is the biggest botany garden out of the borders of Japan and each year it attracts more visitors.